Barcelona or San Antonio or both? Questionmark users conferences are unforgettable. I’ve been to all 14 of them so far and each is engraved in my memory as an empowering, enriching and mesmerising event. We are running two user conferences in the next few months and if you have a chance to attend one (or both!) I promise you won’t regret it. Our first upcoming conference is the Questionmark European conference in Barcelona, Spain on 10-12 November. Barcelona is one of the most exciting cities in Europe and will be a great place to learn from other assessment professionals. You can see details at www.questionmark.com/uk/conference. Our second upcoming conference is the Questionmark US User Conference in San Antonio, Texas on 4-7 March, 2014. San Antonio is the home of the Alamo and the conference venue is part of the River Walk — a uniquely peaceful and positive environment for a conference. You can see details at www.questionmark.com/us/conference. 1. Learn about assessments. I’ve been working with assessments for over 25 years … I know a lot, but I’m still learning. Quizzes, surveys, tests and exams are hugely powerful ways of measuring human behavior and helping organizations improve. There is so much to learn. 2. Learn from Questionmark. Our best presenters and technical experts are at the conference, and they have a lot to share. 3. Learn from peers. Most attendees say that the best thing about a Questionmark user conference is that they meet and learn from peers who have similar issues to them. A problem shared is often a problem solved, and you can find out what other people have done in their organization to solve the problems you are facing in yours. 4. Influence the future of the product. What we learn at these conferences contributes hugely to how we improve our products and services. 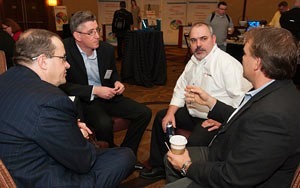 Our product owners (people like Jim Farrell, Austin Fossey, Doug Peterson and Steve Lay) attend the conferences and listen carefully to what our customers say. 5. Great cities. We know that people who come to our conferences go back to their organization passionate about online assessments and enthusiastic about wider use of Questionmark. We choose great venues for our conferences, and provide memorable experiences in a great environment so the conferences are fantastic personal experiences as well as being fulfilling learning opportunities. I look forward to meeting readers of this blog at the conferences. And if any conference attendee can name the cities where the 14 conferences prior to these ones were held, I will buy you to a drink of your choice! Get details here for the European Conference and here for the US Conference.